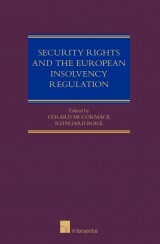 Gerard McCormack is Professor of International Business Law at the University of Leeds. He was previously a professor of Law at the University of Manchester as well as Professor of Law and Dean of the School of Law at the University of Essex. He taught at Queens University Belfast and the University of Southampton. He was a Visiting Professor at the National University of Singapore and a Marie Curie Fellow at the Centre for European Law and Politics, University of Bremen.